When I get overwhelmed with zucchini in the summer I reflexively grab the Food Processor, slap on the 'fine shred' disc, and shred those puppies up before freezing cups of shredded squash in bags. I've noticed I get about 1/2 cup of squash back, when it's thawed and I've squeezed all the water out, so this summer I will be packing 2 cup bags, though right now all the garden volunteers are pie pumpkins, not zucchini, so I'm not overwhelmed. Yet. Just another week in Squashzilla-land. In the dead of winter (see photo below), when even my never-say-die Swiss chard has given up, these bags of green goodness cheer me and make me want to celebrate. With chocolate. It's good to celebrate with chocolate, right? Try these now, or shred and freeze some zucchini to have a mini summer celebration this winter. Either way, you're in for a treat. In a large bowl, combine melted butter, buttermilk, eggs, and vanilla. Dump the dry ingredients on top, and stir until nearly combined. Add the zucchini, and stir until just incorporated. Then, to quote Alton Brown--walk away! Just walk away! [Yes, we still say that to each other at this point in the waffle-making process.] 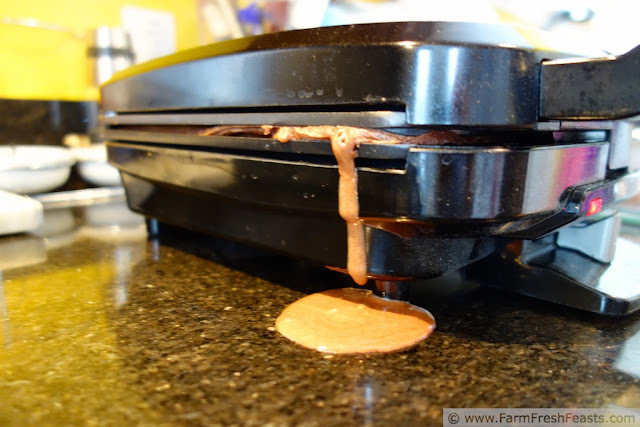 After a nice dog walk, or a shower, or some time noodling around on my FB page, or Pinterest, preheat your waffle iron and give it a swipe with oil or spray. I use about 1/2 to 2/3 cup of batter per waffle, and cook these on the middle setting with good results. 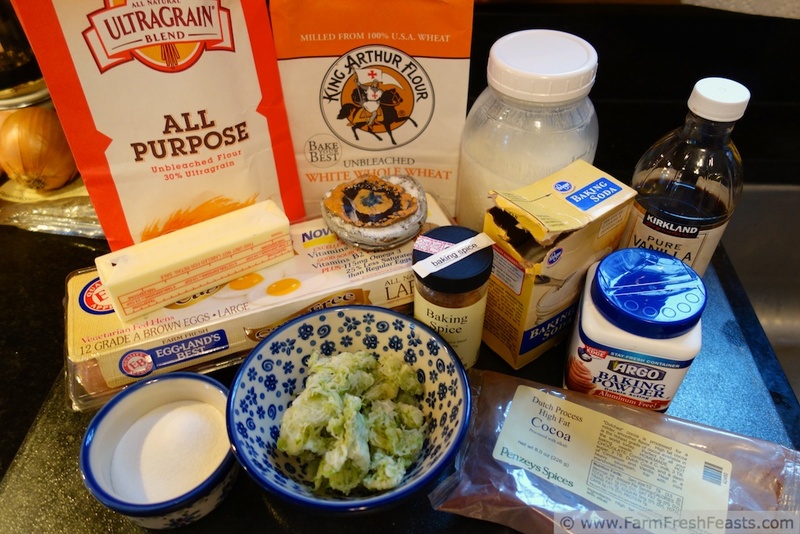 This post is shared at the Wednesday Fresh Foods Link Up, What's Cookin' Wednesday, What's In The Box, the From The Farm Blog Hop, Clever Chicks Blog Hop, Tasty Tuesdays. 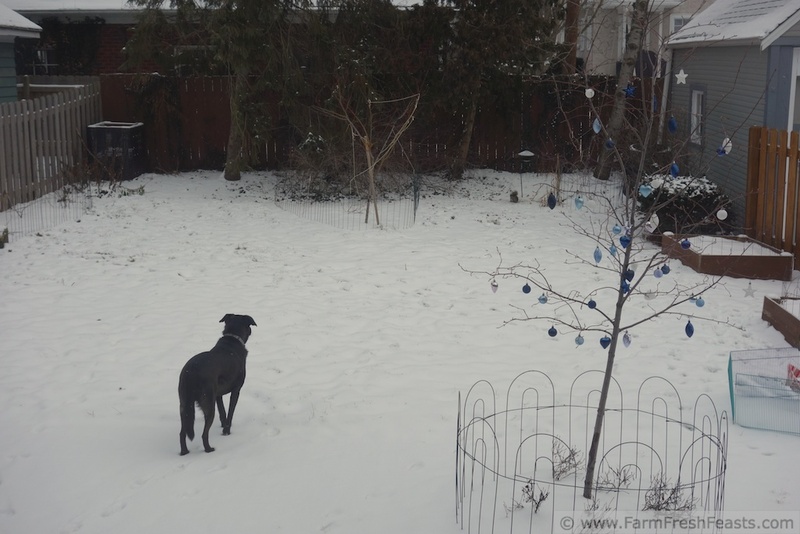 Simon is stalking the squirrel at the base of the feeder. I have made zucchini waffles, and chocolate waffles, but what a great idea to put them together! This one is going on my list to try. I'm glad--will you wait for a snowy day? Now that is a great way to use up all of that zucchini! Making a double or triple batch and freezing the extras would be perfect for school morning breakfasts. That's a great idea--I like it when the kids help themselves from all the breakfast choices in the freezer. These look amazing and I love the combination of sweet and savory! I love this idea! 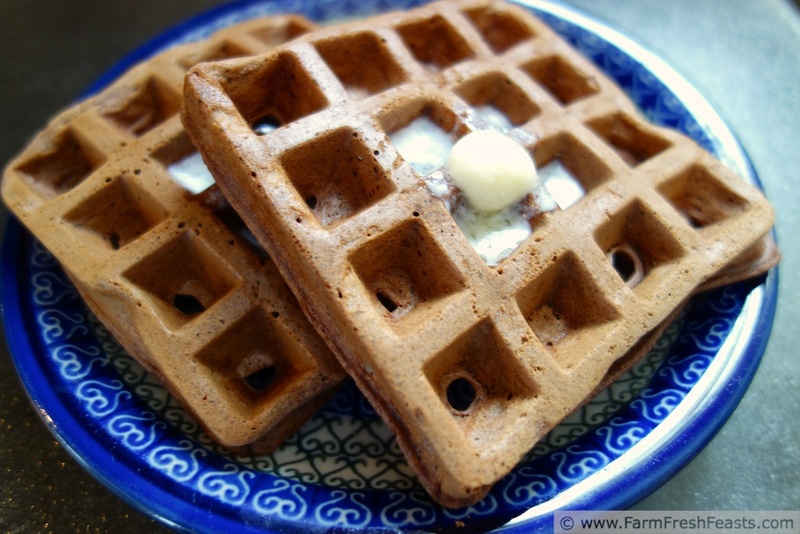 Kind of like chocolate and zucchini bread, but waffles - awesome! They look fantastic. That's what I was going for--bread, muffins, waffles, all a similar vein of combining chocolate and zucchini. Mmmm these sound so delicious!! 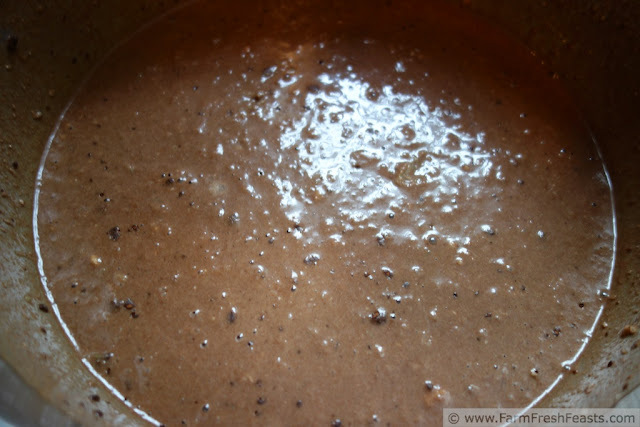 I love the chocolate and zucchini combo! And I really need to get a new waffle maker! 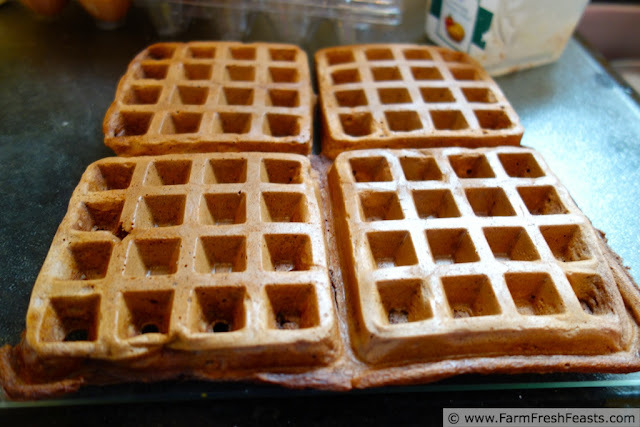 My waffle iron was a Mother's Day present last year and I like how I can make a bunch, keep them warm in the oven, then we can all sit down to eat together. Easier than pancakes! I think your blogiversary is a good enough reason for a new waffle maker, don't you? We made these this morning and LOVED them. They aren't too sweet, and topped them with strawberry mint syrup (jelly that didn't set properly). Yummy way to start the day. Strawberry mint syrup? That sounds like a delicious topping! 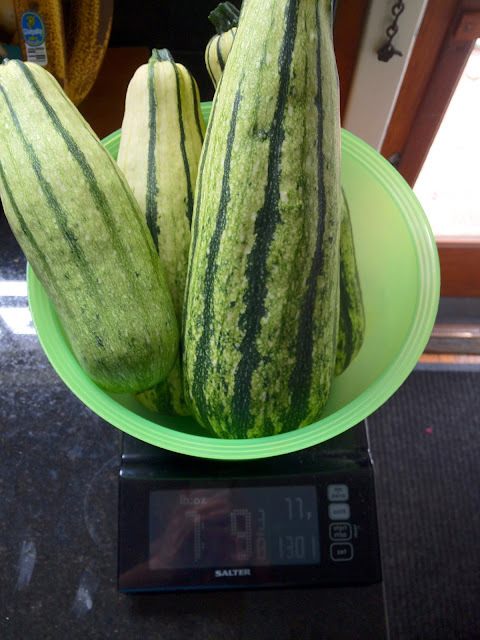 I just realized that one of my mystery squashes is in fact a monstrous zucchini, so I'll be shredded up some this weekend. Yum, I think I would love these in the winter. A nice, comforting breakfast when it's cold outside. Yep, I like hot breakfasts when it's cold out--and for dinner, too! Yum! I made chocolate zucchini bread yesterday and was thinking about zucchini pancakes for today, but I'm liking the sound of chocolate zucchini waffles! :) And what a good idea to freeze some for later - I didn't even know I could do that! Yum, your creations sound delicious! I love having a freezer stocked with veggies--helps us to get through the winter until the garden gets going again. LOVE the idea of shredded zucchini in waffles! Thanks! It really makes me less interested in a plain boring waffle, though there are always times I love a plain boring waffle, too. Waffle sandwiches, even, if the waffles themselves aren't quite right. It is absolutely acceptable to celebrate with chocolate. In fact, I think it's kind of mandatory. I'm sad I don't have a waffle maker and get to say walk away, although I do get to say walk away with your overnight oat muffins so there's something. Plus, I'm pleased you linked up the cake and pancakes because I have been freezing the zucchini this summer, so I will be ready when winter comes. P.S. I like the picture of the waffle oozing out of the hot iron. I never thought to say walk away to the muffins, probably because it's always last thing before I head upstairs to bed. I should say that. Great idea. If I didn't try and scrape every last bit out of the bowl I'd probably have a cleaner countertop and waffle maker. But no, I try and make it easier to clean the bowl . . .
Nice and chocolatey! And without the too sweet, dessert-making chocolate chips. Don't get me wrong, I love chocolate chips, but in my cookies, not my waffles and pancakes. Fabulous! And I love the pic with the waffle batter leaking onto the counter. Thanks! There's something about eating chocolate chip waffles in a booth some time between midnight and 6 am. It's the best time to eat chocolate chip waffles. Or pancakes. Actually, I must amend that--we also go out for chocolate chip pancakes, or waffles, on the way home from the airport after sending off my spouse on a deployment. Other than those very necessary-to-have-chocolate-chips times, I prefer just the flavor without all the sweetness too. Stopping in from Tasty Tuesday-I love waffles and these looks amazing! Thank you--and what a great blog name you have! You've got some terrific harvest recipes--thanks for including mine!